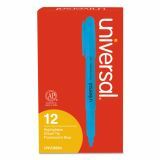 Pocket Clip Highlighter, Chisel Tip, Fluorescent Blue Ink, Dozen - Slender barrel for comfortable grip. Chisel tip produces both broad and thin lines. Pocket clip.